Editor's note: Over the next few weeks, we at IDA will be introducing our community to the films that have been honored by the Academy of Motion Picture Arts and Sciences with an Oscar® nomination in the documentary category. You can see Joe’s Violin on Saturday, February 25 at 3:55 at the Writers Guild of America Theater as part of IDA's DocuDay. 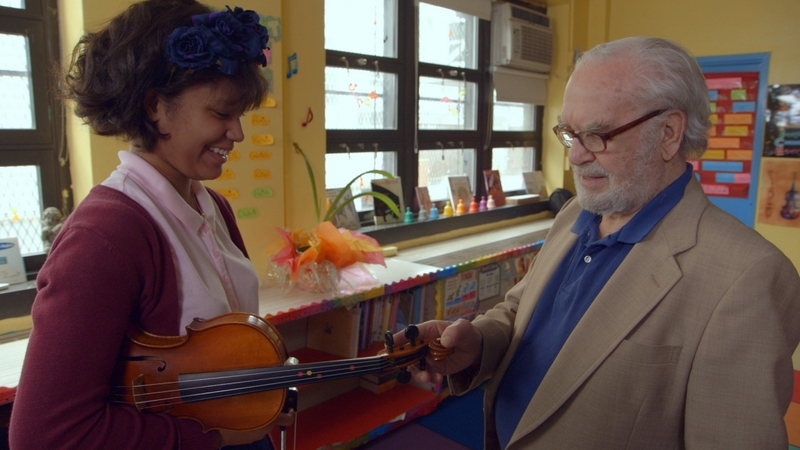 Following the journey of a donated violin that links nonagenarian Holocaust survivor Joe Feingold to 12-year-old Bronx schoolgirl Brianna Perez, Joe’s Violin is easily the most heartwarming of the documentary shorts nominated for this year’s Oscar. Though the violin's story is rooted in unspeakable tragedy, and its recipient lives in the nation's poorest congressional district, the film is marked by disarming displays of goodwill and kindness; it is genuinely hopeful about the persistence of America's highest ideals. We spoke to director/producer Kahane Cooperman (longtime co-executive producer of The Daily Show with Jon Stewart) and producer Raphaela Neihausen (founder and executive director of DOC NYC) about their love-fest of an immigrant story. Kahane Cooperman: It was unusual. It really is one of those things where I think everyone has a million momentary thoughts that cross their mind over the course of the day. This was one of those for me, and I just grabbed it out of the ether and ran with it. I was driving to work and I had my car radio on and I heard a promo for the WQXR Instrument Drive. It was very brief; it was just, "Donate your instruments, [they] will go to New York City school kids in need," and it listed some drop-off locations and a few examples of instruments they'd already received - one of which was a violin from a 91-year-old Holocaust survivor from the Upper West Side. Obviously, I didn't know in that moment if the violin indeed had a story behind it. He could have purchased it a couple years earlier, for all I knew. But I was very curious as to whether it did, and a few moments later I wondered if the student who got it would ever know what this hypothetical story would be. And then it was kind of like, stoplight to stoplight, I just kept having more thoughts. At the next light I wondered what that kid's story was and then by the time I pulled into the parking lot, the idea that these two strangers who live in different parts of New York City would be connected by this one musical instrument was just unbelievably compelling to me. So I set out to find out more about the violin, which obviously did have a very poignant story behind it, and also a 91-year-old storyteller who could tell it in a compelling way. So from there I thought it was worth seeing where it would end up and who it would go to. And did you always know that this would be a short, or even a film? KC: It took me a little bit of effort to finally find myself knocking on Joe Feingold's door just to meet with him. I spent an hour with him; he told me the story of the violin, and I got a sense of who he was. And when I walked out, I knew that I was gonna pursue this film. [But] I had no idea where the violin was gonna go or who would get it and how that would play out. I actually did always conceive of it as a short film. It seemed this very pure and concise story to be told. I never thought of it beyond that and as I went further practically, I wanted to keep a balance between these two main subjects, one of whom has lived 91 years of life and one of whom had lived only 12. And because I wanted to have, as much as possible, an equal investment in these two people so that when they finally meet, you understand why that meeting is so meaningful to each of them as individuals, I felt like I wanted to really narrow in on the meaning of the musical connection between the two of them. The movie is marked by a pretty unusual display of goodwill. Were you expecting to encounter some source of conflict? Raphaela Neihausen: We agree 100 percent. We could not have dreamt up better people. And it doesn't stop with Joe and Brianna. 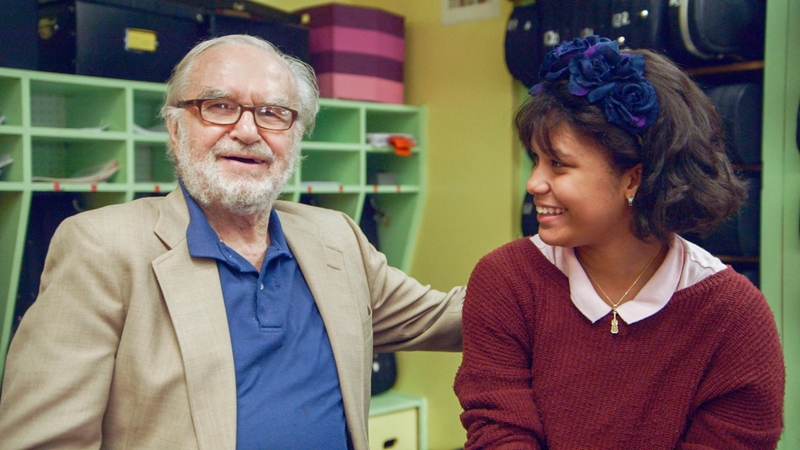 The school; Kokoe, the teacher; WQXR; Mr. Holland’s Opus Foundation: Every single person who's been involved in this, there's sort of like an aura of goodness around it. And often times when we were making it, we would just look at each other and say, If we had written this as a fiction film, nobody would have ever believed it. Several of your fellow documentary Oscar nominees explicitly tackle immigration as a subject. Your film contains a lot of today's hot-button issues: fascism, immigration, public education. Do you see Joe's Violin as a political film? RN: Not intentionally, but I do agree with you that it organically incorporates a lot of the important topics that are being discussed right now and that are at the forefront. At its heart, this is really an immigrant's story. Joe came here as a refugee from World War II, and Brianna's parents came here from the Dominican Republic to make a better life for themselves here. And it was interesting, we were together with Kokoe, the teacher, and Brianna yesterday for the [Oscar nominee] luncheon, and we looked at each other and realized that all four of us are first-generation immigrants. But I think for myself - I'm not speaking for Kahane - that the only reason I'm reluctant to call it political per se is I feel that politics are so incredibly divisive these days and if anything, our film is transcending politics by just reminding us of the shared humanity and values we all share. Your film has been released on The New Yorker’s website. Did you initially follow the independent filmmakers' journey of taking the film to festivals and hoping to get purchased? KC: Absolutely. It's been, the whole time, until very recently, the two of us. RN: Film festivals were a vital part of this film's journey, even in terms of our own friendship: Kahane and I met because of a film festival. I moved out to Montclair, New Jersey, five years ago to help start the Montclair Film Festival. And Kahane's on the board of that festival and lives in town and is my neighbor and a good friend, and it was through that friendship that we ended up collaborating on this film. A lot of the other behind-the-scenes collaborators are people we know from our town. KC: It's a community effort. It was 100 percent Kickstarter. I put in personal funds at the beginning so we could have a trailer for Kickstarter, but we made our film by donations, small and a few large, from many, many people. Have Briana and Joe been involved in the Oscar festivities? RN: Since we've been nominated, we have all gotten together. And we have had a few screenings in the last few months in New York where Joseph's been able to come and participate with Brianna. And we've brought Brianna here to Los Angeles. It's a little more challenging with Joseph because of his age; it's a tough trip to make, to fly out west. Speaking about an instrument accumulating parts of history and experience, it's been out here in LA during this whole luncheon, and Kahane was actually about to tell you about one of the most extraordinary parts of our day yesterday. KC: Yesterday after the luncheon, we were brought out poolside to await the press opportunities, and one of the celebrities that Brianna was incredibly hopeful that she would get to meet is her idol, Denzel Washington, who happened to be out there near us at the same time. I'm not one to go straight up to celebrities, but she wanted to meet him so much and she actually had Joe's violin in a case on her back. Somehow, eye contact was made and we approached Denzel Washington and he said to Brianna, "Oh, do you want to take a picture? Okay, I'll do it under one condition: If you play something for me." So, spontaneously, by the side of the pool, Brianna opened up the case, took out Joseph's violin and played Pachebel's Canon in D for Denzel Washington for two-and-a-half minutes. I recorded the whole thing on my phone and Denzel Washington listened in such a beautiful way the entire time. At one point she [flubs] it and he says, "It's okay. Mistakes are the best part." She completed the song and then they just embraced in the most meaningful hug and it was just incredible. It was very thrilling for her and all of us and so meaningful and really gracious of Denzel Washington to give her that moment. And they connected on the fact that they're both from the Bronx, so it was pretty amazing. Akiva Gottlieb is the IDA's Communications Manager and Associate Editor of Documentary magazine.